The Brownie got its name from its color, since the first Brownie was a chocolate desert, however there are now variations on the theme, with Brownies that don’t contain any chocolate at all. 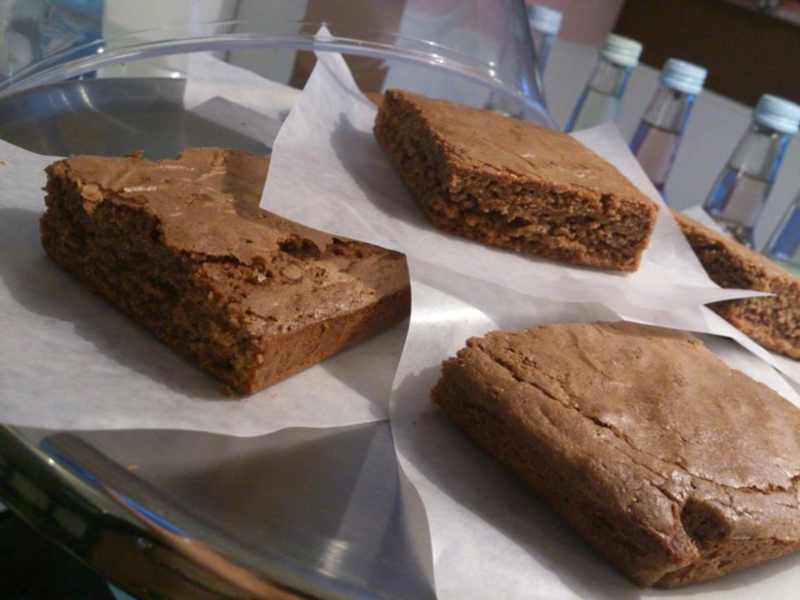 Vanilla Brownies are often called BLONDIES, for the same reason. Brownies over the year have made it over to this side of the ocean, but there are a few things that, as a purist, I need to share with you, so that you can distinguish the real thing from all those imitations out there. First of all, Brownies are SQUARE since they are baked in square or rectangular tins and cut into portions. They are NOT cooked in cupcake tins and cupcake papers… Their texture is not soft and airy, nor are they soaked and dense, they are half way in between, with a chewy soft inside that rests in the mouth for a while. This texture is obtained through the use of oil as fat (sunflower oil, peanut oil), or margarine rather than butter. So the next time someone tries to pawn off a muffin or a cake on you, you’ll know the difference! ;-)). First heat the oven to 350°F . Prepare your baking tin – either greasing it with butter or lining it with grease-proof paper, if it’s a metallic tin. If it’s one of the new silicone ones, you won’t need to grease it at all, it will peel right off the Brownie once cooled. Heat the chocolate and butter over low heat, and mix thoroughly, then let cool while you mix the rest of the ingredients. Beat the sugar, eggs and vanilla extract on the high speed of your mixer until the mixture is light and airy, then add the chocolate/butter mixture. At this point, don’t over mix. Blend in the flour, and fold in the nuts and chocolate chips. Pour the mixture, which will be slightly stiff, into the cake tin and pat it down into the corners. Bake for 40 to 45 mins, or until a toothpick inserted in the center comes out with slightly moist crumbs, and the cake starts to pull away from the sides of the pan. Cool before trying to remove from the pan, then cut into squares and serve. You can also ice these cupcakes with Chocolate Icing if they aren’t decadent enough for you as is, but I think they are just right like this, slightly warm… M-Joy!